my bare cupboard: Stir fried udon noodles with ( homemade ) char siu "
What's not to love about this dish?! Simple , fast and really satisfying ! One of my favorite stir fry noodle combination , udon and char siu . Easier than making gon chau ngau ho since udon has a firm texture . If you don't like a darker noodles , you can reduce the dark soy sauce . But lime juice and chilli sauce is a must for this dish ! I still have some char siu left for making char siu buns though it's really , really hard to keep my grubby hands off it ^___^ "
* Cut char siu and spring onions into about 1 - 1/2-inch in length ; the sliced carrots and bell pepper should be about the same size . * In a small bowl , mix the broth , dark and light soy sauce and sugar , set aside . * In a large non-stick pan or wok , over medium heat , pour about 1 tablespoon oil , when oil is hot , add in onion and cook for 3 minutes . Add ginger , char siu and carrots , cook for a minute .Transfer mixture to a plate , set aside . 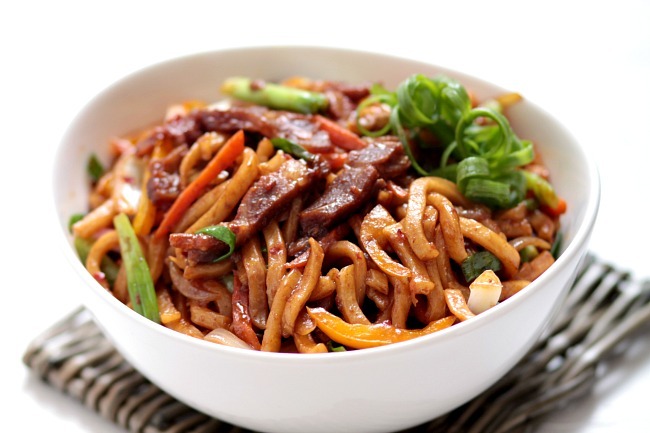 * In the same pan or wok ( be sure that the wok is really hot so that noodles won't stick ) , over medium-high heat , add in the noodles , stirring from time to time , cook for 4 minutes . * Add in the char siu mixture and bell pepper to the pan and mix well . Pour in the broth mixture , stir well to combine , adjust taste . Cook noodles , stirring constantly until the liquid is nearly absorbed then add in the spring onions , chilli sauce and lime juice . Give another good stir , dish up and serve hot . I am HUNGRY, Anne. 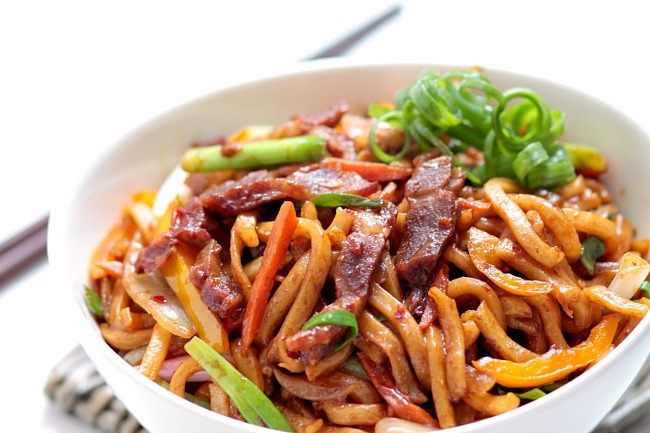 Indeed...what's not to love this delicious noodles stir-fry!! Seriously Anne, you can't keep sharing these dishes with us and not let us at least smell them! Not to mention, I have so many of your recipes bookmarked, I could write a book. On second thought, you should write a cookbook so my bookmarks don't go a mile long just with your incredible recipes! Thank you so much for sharing, Anne...Yes, bookmarked! Yes, a totally loveable meal this is Anne! Nice and simple, slurp! I also Hungry Anne, perfect for lunch! Yummy, would love to have a bowl of this right away! No wonder you propose your LTU theme to be noodles and pasta!!! You are sure a 100% noodle person. Me pineapple??? ha ha ha!!! 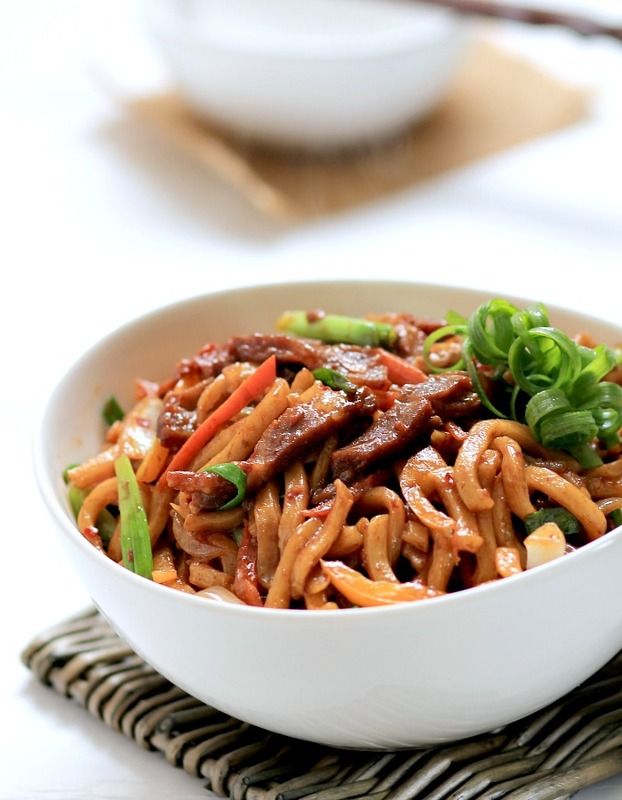 Your char siu udon noodle looks yummy! Zoe , you're a pineapple tart , bao and bread person lol Re Kit , I've been clicking her site since then but so far .... Hope she's lurking - hey Kit ;D Go , Louise ! Yesterday, me and my boyfriend went out to buy sushi for his whole family, but his brother wouldn't eat it because he said the only Japanese food he likes is anything with udon noodles. I should have just made this for him instead, this looks fantastic! This is certainly my kind of dish! I can polish off the whole bowl and come back for second helping! looks so good!